Congratulations to all our Lean Six Sigma Students who received their QQI results this week. We are very proud of their achievements which resulted in an average cost saving of €45,000 per project! Particular thanks to John Ryan, Éamon Ó Béarra and Nicola Donohoe for their support and mentoring to the students. 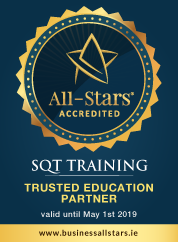 To date projects completed by SQT students have made a combined saving of over 97 million for their companies.